K-Super Block is a heavy duty system designed for both side skirting and rear seal material containment. The skirting blocks are made from high performance engineered polyurethane. The backing plate and all other hardware can be either painted mild steel or T304 Stainless Steel. Kinder Australia’s K-Super Block Skirting Seal System is designed to seal the conveyor transfer points, but instead of a continuous skirt length, the system is uniquely designed to include separate 25mm skirting blocks. The polyurethane skirting blocks are held in position using a standard bolt mechanism to a series of serrated clamp plates. These are then fixed to the main supporting backing plate. The design of the forward-angled serrated clamp teeth prevents any movement from the individual blocks. 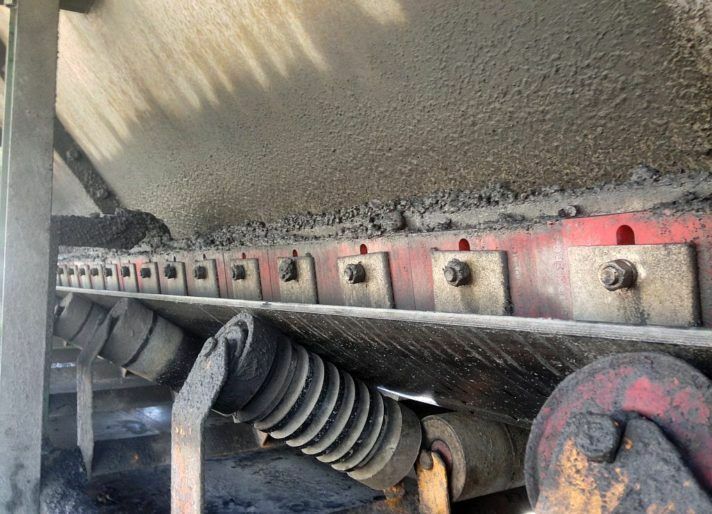 Individual blocks can easily be adjusted up or down to suit the belt profile, as well as provide greater compatibility with load volumes, and therefore create a totally spillage-free environment. The low coefficient friction properties of the polyurethane translates to reduced power consumption and longer wear life. Suitable for all belt widths and belt profiles. Available in fire-resistant, fire retardant anti-static formulas (FRAS). Individual blocks can be replaced and adjusted without interference to adjacent blocks.